With Sydney offering up some of the best beach days of the year this week, I can't tell you how happy I am to be able to sip ice cold water from my beautiful blue water bottle. And no, I'm not putting ice cubes in it - this bottle is double-walled, providing amazing insulation. 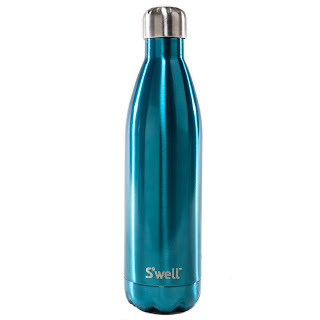 S'well bottles sure are, well, swell. (I'm sorry, I had to pun!) Not only do they live up to my high style standards, the insulation is remarkable. Cold liquid stays cold for 24 hours, hot liquid stays hot for 12 hours, with none of the bulky plastic, foam or neoprene you may expect. Even after sitting in a hot car or sizzling under the Sydney sun, my water comes out fresh and cold. Even better, S'well is a partner with WaterAid, an organisation that works to bring clean water to some of the world's poorest communities. To date, WaterAid has reached over 14 million people around the globe. Given the fact that over 2 million people die from water-related illness each year, this is an organisation that I'll happily support. 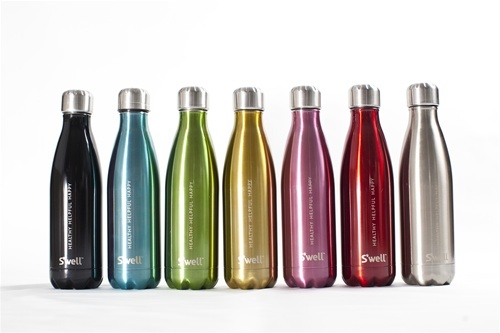 S'well bottles come in a range of fantastic colours and sizes - even one perfect for bringing chilled wine on a picnic - so if you're in the market for a new reusable beverage vessel, this one comes with my seal of approval! I bought my bottle in California last year, but you can purchase them in Australia from Shop Naturally under the name of Beautiful Beaches (I don't know if they support WaterAid). You can definitely forego the neoprene pouch - they are self-insulating and don't need anything extra. If you buy one, let me know what colour you get, it's a tough decision . . .